After you have decided to rescue a greyhound, look for a companion in a rescue center.Once you have found The One—and make no mistake very often the greyhound will pick you—it is time to bring your new friend home. My Harpy, choose us when she first laid eyes on us, right off the track. We were going to foster two dogs when a track shut down. One was adopted, but Harpy decided she was staying with us. She has been my constant companion ever since. There are several things that you need to have in place beforeyou rescue a greyhound. The most important thing is to have a fenced back yard or a secured place where your greyhound can venture out and cannot take off. As mentioned before they are sight hounds and will take off like a shot when they see prey. Even taking them for a walk on the leash you need to be mindful of your surroundings. Is there any small game that they see? If they see something they will bolt and possibly knock you off your balance. Greyhounds can go from 0 to 30 in three leaps—can you do that? Once on a walk with our Killian my husband was allowing him to wander to the end of the leash. There was a woman playing on her front yard with a Lab catching a Frisbee. Killian saw the dog running and thought the starting gun had gone off—he almost pulled Bill off his feet. So when walking your greyhound keep the leash tightly looped around your wrist and your dog up close to you as you walk. You must use a Martingale collar for your adopted pet. Their necks are long and delicate and the use of a choker collar or traditional dog collar is not recommended. A greyhound’s head is smaller than their neck they can slip out of traditional collars and you could lose your dog. A choker collar would harm their neck. Not to mention that the Martingale collars come in beautiful patterns and are stunning on the majestic greyhound. Most rescue groups will have access to these collars and leashes but fancier ones are available on-line. After you rescue a greyhound remember you new pet's previous life. When racing, greyhounds are kept in crates and are used to being crated. This is helpful in many ways. Crating is not necessarily a bad thing unless the crate is too small for the dog. They need to have enough room to turn around and have good ventilation. When they first come into your home it is advisable to crate the greyhound when you are going out—but NEVER leave a greyhound in a crate for more than eight hours. Most greyhounds will find the crate a safe place of their own and members of the household, especially children should respect that space. Do not allow children to climb into the crate. Greyhounds do not understand children, they have never been exposed to children while racing so they have to get used to small people.Remember like any other adopted pet, they must get use to their environment. A nice soft bed to sleep on is a welcome change for the shredded paper, straw or hard floor that most greyhounds sleep on when racing. To have a nice soft bed to sleep on is heaven for a rescued greyhound. Here is another little quirt about greyhounds—they tend to sleep with their eyes open. If you see your greyhound lying around looking like there are in a stupor they could be fast asleep. So be very careful not to disturb that sleeping dog. 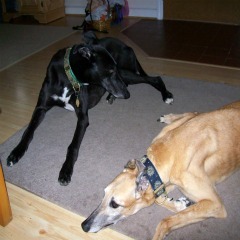 As we mentioned before, the greyhounds have long and delicate necks as well as long legs. For this reason they need to have their food and water bowls elevated. Picture a giraffe trying to drink water from a stream—that is what a greyhound looks like trying to eat or drink off the floor. These stands are available in most pet supply stores or if you are handy you can build your own. Depending on your climate you may need a coat or sweater for your greyhound. They have very little body fat and thin fur so the cold is dangerous to the greyhound. On the flip side of that coin because of the lack of body fat they don’t smell like dogs and only need to be bathed a couple of times a year.